At the core of the work we do at Blackstone Valley Prep is our mission: “To prepare every scholar for success in college and the world beyond.” Knowing that the “world beyond” is full of complex issues, fully preparing scholars includes providing them with the tools they need to manage and contribute to deep conversations and healthy debates. It also means empowering scholars and showing them that their voice is valued. At the beginning of the school year, scholars at MS1 are placed into small groups of peers, called Breakfast Clubs, with the intention that these same groups will remain together throughout their time in middle school. Once a week, these groups meet to have meaningful and often complex conversations. For example, this past week scholars weighed in on Colin Kaepernick’s refusal to stand for the national anthem. With teachers as facilitators guiding the conversation and holding the group to discussion norms, scholars discussed why people choose to protest and what they believe are appropriate ways to do so. 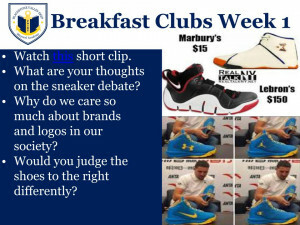 Another week, scholars discussed Starbury sneakers, a new brand of sneakers designed by a former NBA star challenging the cost of other major shoe brands. Scholars shared their opinions to questions this raised about the role brands play in our decisions as consumers as well as how we may or may not judge shoes and the people who wear them. Scholars are learning important life skills–how to respectfully disagree and share opinions on everything from fun topics (like suggesting mascot names) to those that are emotional or controversial. But there is more here than meets the eye. Scholars are also being asked to think critically about the world around them and to examine multiple points of view–both key elements of rigorous learning. Over time, peers are also learning to build trust, strong relationships, and a support system – all things we feel they need on their path to success.